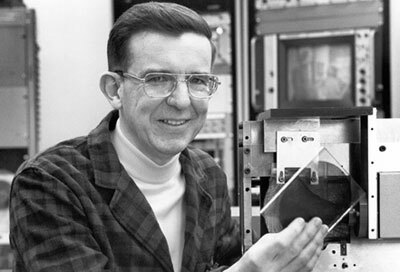 The first workable digital compact disc device, the precursor on now ubiquitous CD/DVDs, was invented in the late 1960s by the American physicist James Russell. 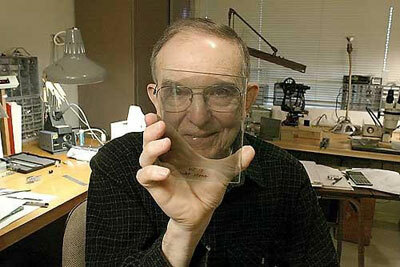 In 1953, Russell earned his Bachelor degree in physics and graduated from Reed College in Portland. Afterwards he went to work as a Physicist in General Electric's nearby labs in Richland, where his wife Barbara worked as a chemist. At GE, working for the Hanford Nuclear Plant, and appointed as a "designated problem-solver" for GE experimental unit, Russell initiated many experimental instrumentation projects. He was among the first to use a color TV screen and keyboard as the main interface between computer and operator. He also designed and built the first electron beam welder. In 1950s and early 1960s, Russell, who was an avid music listener (he was found of classical music—Beethoven, Chopin, Mussorgsky, Offenbach. etc. ), quite frustrated with the wear and tear of his vinyl records and their poor sound quality, tried to improve the record player. Initially he tried using a cactus needle, instead of steel one, for a stylus, but with no success. "After each record you had to resharpen the needle," he recalled. Alone at home on a Saturday afternoon, he suddenly realized that the wear and tear on the records due to the contact from the stylus to the record, can be avoided by using a light to read the music without physically touching the disk. Moreover, as he was familiar with digital data (in punch card or magnetic tape form), he could accomplish this task in a digital way, more efficiently and effective. He realized, that if he could make the binary code compact enough, he could store not only symphonies, but entire encyclopedias on a small piece of film. "I realized that if I wanted to store music, there weren't enough bits on the conventional digital tape around at the time," he said. "So I came up with the optical process." In 1965, the Ohio-based Battelle Memorial Institute opened its Pacific Northwest Laboratory in Richland, to took over management of Hanford's lab, and James Russell joined the effort as Senior Scientist. Thus he gained an audience for his more far-fetched ideas and immediately began to pepper Battelle with proposals for new commercial concepts. The optical digital technology was initially met with skepticism, as it was not believed that one could digitize sound. "Here I was at Battelle, enmeshed in the scientific community, and one of the first things I had to demonstrate was that you could digitize music and reproduce it" he said. "Music into numbers? Come on now, Russell." Battelle eventually let Russell pursue the project, and after years of work, he succeeded in inventing the first digital-to-optical recording and playback system (the earliest patent by Russell, US3501586, was filed in 1966, and granted in 1970). Russell had found a way to record onto a photosensitive platter in tiny "bits" of light and dark, each one micron in diameter. A laser read the tiny pits (binary patterns), and a computer converted the data into an electrical signal, which it was then comparatively simple to convert into an audible or visible transmission. Through the 1970s, Russell continued to refine the CD-ROM, adapting it to any form of data. However, like many ideas far ahead of their time, the CD-ROM found few interested investors at first. In 1971, Eli S. Jacobs, a New York venture capitalist, pioneered the commercialization by forming Digital Recording Corporation to further enhance the product for the consumer video market, and hired Russell and a team of technicians to come up with a video disk. Their efforts led to a 20-minute video disc in 1973. "The vision I had in mind was of television programs on little plastic records. The networks, instead of putting programs on television, would print records. And if you wanted to watch your favorite programs you'd get them in the mail and put in the disk whenever you want," Russell said. "Jacobs thought, if we can do it, hey great, we've got the whole world by the tail. And if we can't, well at least you know where you are." In 1974 Digital Recording Corporation announced an optical digital television recording and playback machine, the first device to digitize a color image, at a Chicago trade show. The response from large potential investors was rather cool. Philips Electronics representatives visited Russell's Battelle lab in the summer of 1975, and they discounted the entire premise of his work. "They said: It's all very well for data storage, but you can't do that for video or audio." recalled Russell. Philips had just released its laser disc, an analog optical video player, and they were convinced that analog was the only way. "Philips put $60 million into development of the laser disc. We were advised that nobody would tell them they had made a mistake." Sony launched its CDP-101—the first commercialized CD player in 1982. Sony and Philips paid royalties from CD player sales to Battelle and to Optical Recording Corporation. Time-Warner and other disc manufacturers settled with the Optical Recording Corporation in 1992, paying $30 million for patent infringement. The court determined that Optical Recording had the sole rights over the technology mentioned in the patents. But because the patents properly belonged to Russell's employer, he never got a cent out of either deal. By 1985, Russell had earned 26 patents for CD-ROM technology. He then founded his own consulting firm, where he has continued to create and patent improvements in optical storage systems, along with bar code scanners, liquid crystal shutters, and other industrial optical instruments. His most revolutionary recent invention is a high-speed optical data recorder and player that has no moving parts. Russell earned another 11 patents for this "Optical Random Access Memory" device. James Russell has more good ideas before breakfast than most people do all their life. He has originated more than 50 patents in his lifetime. He also dreams big. He would end suburban sprawl by building a hive-like linear city of lots stacked a half-mile into the sky, looking out onto roadless countryside. Trains running on superconducting rails would flit through tunnels under the city. Bikers, pedestrians, and drivers could hop on and get off at each station. Nice, uh! Just like the hop on hop off NYC buses. Right now the NYC subways accommodate pedestrians and bikers, but allowing cars on a train was definitely a unique idea!